Thanks to the popular body positivity movement, scouting for cute swimwear pieces is no longer much of a chore. In fact, with almost every swimsuit brand catering to all shapes and sizes, swimsuit shopping has become super exciting! Nowadays, the only task we’re faced with is looking for the perfect piece to support all our beach activities — because we need both fashion and function. This said, here is our guide on how to choose swimwear that suits your beach lifestyle. It’s officially the season to be sun-kissed, and nothing screams ‘beach bum’ like a good tan. With the sun blazing all day, now is the best time to get that summer glow. To achieve an even complexion, remember that less is more. Don’t be afraid to sport strapless bikini tops and cheeky bottoms, especially if you’re going to spend your time at the beach sunbathing. This way, you won’t need to stress about hiding your tan lines when you’re back at work. Besides, who doesn’t want to look like an au naturel morena this summer? Finding a bikini that supports movement can be extra challenging — but it’s not impossible. Avoid wardrobe malfunctions by carefully testing each swimsuit you’re eyeing before purchasing it. As you try on a swimsuit in a dressing room, don’t just check if it flatters your body — move as much as possible. Bend forward and backward, jump up and down, stretch your limbs, etc. If the swimsuit doesn’t come off despite your exaggerated movements, then it has a better chance of staying on while you’re facing harsh waves or spiking a volleyball. Aside from high-quality one-pieces, adjustable bikinis are your best friends. For tops, criss-cross backs stay on the best. They also provide maximum support for your breasts. If you’re still hesitant about your bikini, you can always go for a sports bra and board shorts combo. With your beach hat and trendy shades in tow, you have all that it takes for your Instagram followers to double tap your photos. Of course, the star of your outfit must be your swimsuit — you’re posting a #beachlife photo, after all! Since looking and feeling good are your top priorities, you have all the freedom to experiment with unconventional cuts and interesting prints. Have fun swimsuit shopping and pick pieces you can mix and match, so you’re less likely to repeat an OOTD. It’s almost inevitable for an ocean lover to become an eco-warrior, and swimwear brands know this! Because of this, many brands have started producing sustainable swimwear made out of recycled materials such as fish nets and excess fabric. 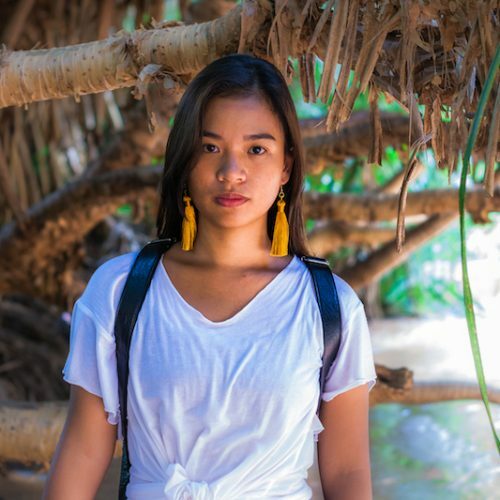 Aside from scouting for a swimsuit made out of recycled materials, an environmental advocate can also opt to look for a swimsuit brand that supports local products and services. Choosing locally-made swimwear not only supports our local community and economy — it also leaves behind a smaller carbon footprint..
Not everyone is comfortable in a teeny-weeny bikini, and that’s okay. Fortunately, there are now numerous conservative swimsuit styles to choose from. This being said, wearing conservative swimwear doesn’t have to be boring anymore — you can now choose to show less skin and still flaunt your assets! High-neck onesies, stylish rash guards, and chic tankinis are the way to go. High-cut bikini bottoms are also trendy nowadays; skirted styles are cute, too. Ultimately, finding a style you’ll feel comfortable and confident in is what matters most. Tip: Can’t find a swimsuit that you like? Don a sarong, poncho, or crocheted dress over your plain swimsuit instead! Just like any other clothing item, the ideal swimsuit should reflect both your lifestyle and your personality. Invest in quality pieces that will last you multiple beach trips, so that you won’t have to spend your money on swimsuit shopping every time you head to the beach. If you’re a carry-on traveller, then opt for comfortable swimsuits that can double as cropped tops, bodysuits, or even underwear! This way, you can save a large amount of luggage space. Happy shopping!